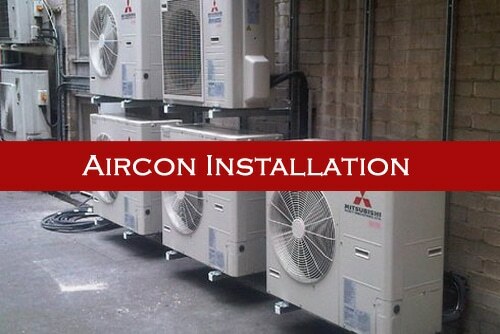 Are you looking for aircon installation in Singapore for your house or office? Regardless of whether you are looking to install brand new aircon system or looking to replace your existing malfunctioned or old air-conditioner, we are able to provide you with the suitable air-conditioning system that suit your needs. We are able to provide quality air-conditioning installation for your home or offices by understanding your installation needs. There are many different types of air-conditioner in Singapore, so how do you know which air-conditioning system suits you? In Singapore, the common air-conditioning system that is installed in HDB flats or Condominium are system 3 or system 4 aircon system. For most landed property, home or in offices and warehouses, the most popular is ceiling cassette aircon unit as it is suitable for cooling down bigger sized area. We provide both inverter and non-inverter air-conditioner installation in Singapore. Both types of aircon system are suitable for different premises such as HDB, condominium, landed properties or offices. If you would like to know more about the air-conditioner installation, you can contact our staff for more information. Our company provides qualified and professional air-conditioning installation of a wide range of air con brands and models. This includes inverter aircon and non-inverter aircon in Singapore, where our staff are all well-trained to install different air-conditioning brands and models. The air-conditioning brands that we carry and specialise in includes Daikin, Mitsubishi Electric, Mitsubishi Heavy Industries, Panasonic, LG, Fujitsu, Carrier, Sharp, Toshiba, Samsung, Midea, Mcquay, York, Sanyo and many more. We provide air-conditioner installation for a wide range of air-conditioning system such as wall mounted aircon units, ceiling cassette aircon unit, ceiling suspended aircon unit, windows casement aircon unit, room aircon unit and much more. With the various types of air-conditioner in Singapore, finding the best suited aircon unit for your home or office can be challenging, however, do not worry as you can contact us to find out more on the air-conditioner and we will advise you on the air-conditioner that will best suit your cooling needs for your home or business. After considering the above factors, we will advise and choose the most suitable air-conditioning system for our customers depending on their needs and also budget. By choosing the correct and suitable air-conditioning for your home or office, you will enjoy greater benefits in the future. In our air-conditioner installation services, we offer additional services which are included in our installation service. The details of the add-on services that you require can be further discussed with our staff upon confirmation. Some examples of the services we include in our installation service is the removal of the existing old air-conditioner from wall, ceiling or window, installation of approved stainless steel support brackets and much more. Thus, if you require any particular air-conditioner installation needs, you can discuss with our staff and we will advise you accordingly. Other than air-conditioning installation in Singapore, we also offer a wide range of aircon services such as aircon servicing, chemical wash, repair, maintenance contract and many more. We aim to be your one stop aircon company in Singapore. With our experience in providing a wide range of aircon services in Singapore, we will be able to provide quality services to our customers and meet all your air-conditioning needs. If you are looking for a reliable and professional aircon installation company in Singapore, you can give us a call today. Wei Wei Air-Con Engineering Pte Ltd is one of the leading aircon contractors in the aircon industry for more than 20 years. Some of the aircon services we provide includes aircon servicing, repair, chemical wash, maintenance contract, chemical cleaning, installation and many more. With our experience and expertise, we believe that we are able to meet your aircon needs in Singapore. Feel free to contact us if you require any of our services. If you would like to enquire about our aircon services, you can call us at +65 6567 7698 or by filling our contact form. © Wei Wei Air-Con Engineering Pte Ltd. All Rights Reserved.